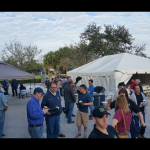 In the winter, if you are looking for many of the top thoroughbred horses and trainers, you are most likely to find them in Florida so that’s where I headed recently. 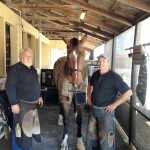 I began in Wellington, where I was able to attend the AAPF sponsored clinic at Visby Products, one of our FPD dealers. 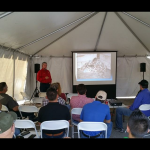 The clinicians were AAPF members Mike Heyward, Shane Westman, Curtis Burns, James Gilchrist and Dave Farley. 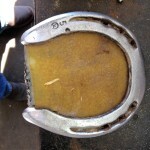 Farriers in attendance were particularly interested in the Kerckhaert Comfort and DF Quarter Motion horseshoes. 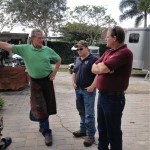 I enjoyed talking with farriers between the clinician presentations. 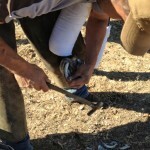 While in the Wellington area, I had an opportunity to visit John Favicchia who was shoeing at a private stable. 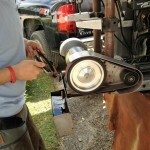 John is a big user of Kerckhaert and FPD products and it is always a pleasure to watch him at work. 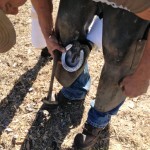 His evaluation of each horse and limb – and the ability to modify and apply what works best for the individual horse is very impressive. 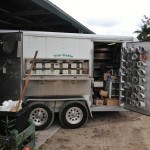 Among the inventory on John’s truck, you can find a range of Kerckhaert DF, SX-8 and Meister horseshoes. 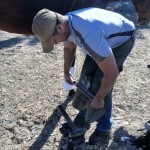 At the Lindy Standardbred Stable in Wellington, I was able to catch up with Tim Cable where he was busy shoeing Standardbreds using, I am happy to report, various Kerckhaert shoes. 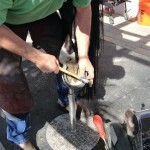 Tim comes from a long line of farriers; his grandfather, father, uncle and cousin are all farriers. While primarily focused on Standardbreds, Thoroughbreds and Hunter Jumpers in his business, Tim has clients that span a variety of disciplines. Tim uses a wide range of Kerckhaert shoes, including Kerckhaert Full Swedges, Half Swedges, TDR’s, SX-7 and Kerckhaert aluminum race plates. 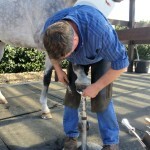 You can find Tim frequently modifying his shoes for the individual horse, using his forge or Baldor Grinder with 10” Expander Wheel. 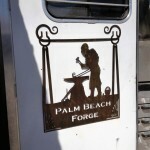 I found TJ Jones of Palm Beach Forge and Donnie Mills working together at the Show Grounds in Wellington. While TJ has been in the Wellington area for many years, Donnie relocated from Kentucky just a couple of years ago. I always enjoy visiting with these guys when I am in Florida. 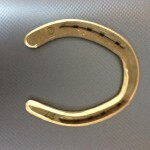 They are strong supporters of the Kerckhaert brand, specifically DF shoes. 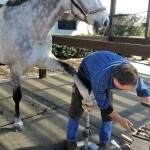 Well known and respected farrier Dave Farley and his associate Cole Rutan were working at a private stable in Wellington where I had an opportunity to spend time with them – and farriers Matt Savage and Gary Gatts, who were riding with Dave for the day. 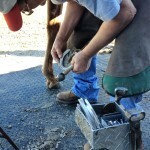 Dave is a great mentor for many farriers, and his professionalism and talent make him a pleasure to be around. 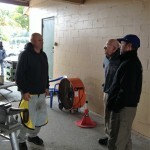 We were all impressed with the efficiency, organization and continuity of Dave and Cole’s work. 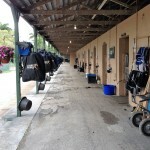 Payson Park Thoroughbred Training Center in Indiantown, Florida has been a winter destination location for many of the top Thoroughbred horses and trainers for years. 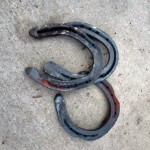 There, I met Jim “Jimbo” Bayes and his son, JT Bayes while they were shoeing horses for Hall of Fame trainer, Claude “Shug” McGaughey, III. 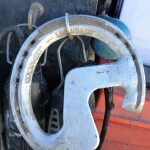 Jimbo worked with his father, Jim, Sr. who shod horses for the famous Ogden Phipps stable for many years before Jimbo took over. 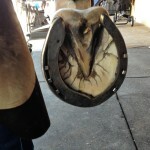 With the Kerckhaert Tradition Hind and Legendary XT Front as their shoe of choice, it was an honor to observe Jimbo and JT shoeing some of the top Thoroughbreds. 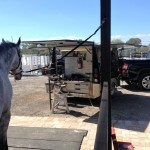 It was a beautiful Florida morning when I arrived at Tampa Bay Downs. 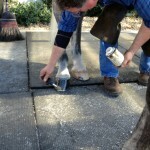 Tampa is a great location for horsemen and farriers to work during the winter. I always look forward to the sights and sounds of the barn area of the race track in the morning. 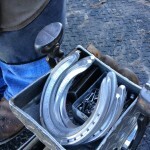 On this particular visit, I was able to ride along with Matt Kueffner while he shod horses, using various Kerckhaert race plates. 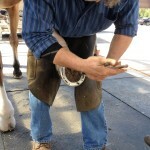 On this particular visit, I also met farriers Chad Janssen, Ricky Tucker, Hutch Holsapple and John Jerdee. There was a buzz in the barn area about the upcoming Saturday big race card, where it turned out Todd Pletcher trained horse, Destin, won the Sam F. Davis Stakes. 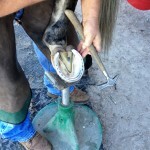 As my Florida trip wound down, I was able to attend the Palm Beach Farrier Supply clinic. 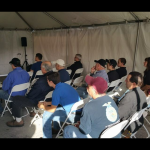 Well attended by farriers, everyone enjoyed fantastic food, good weather and a great clinic led by clinician Luke Proulx. 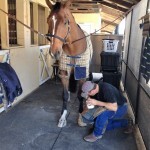 Luke started the day with a PowerPoint presentation and followed up the second half with a shoe modification. 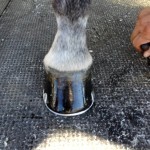 Using several Kerckhaert DF shoes, he demonstrated various modifications for traction and lateral support. 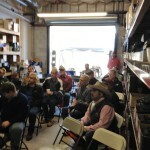 The Kerckhaert Aluminum Comfort, DF Quarter Motion and Liberty nails were favorites of many who attended. 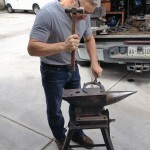 As you can see, I had a busy couple of weeks in Florida and really appreciated the hospitality and the opportunity to see some great farriers in action. The sunshine wasn’t bad, either!